Four months away from a U.N. super-summit on climate change, world leaders remain stymied about how to fulfill Secretary-General Ban Ki-moon's demand that they bring "bold pledges" to the high-level meeting. With midterm elections around the corner, the Obama administration is hardly likely to announce new carbon targets or finance at the Sept. 23 summit. The European Union isn't expected to nail down a decision on its 2030 emissions cuts until the end of the year. India just ushered in a new leader, and Brazil is gearing up for its own October election, making new initiatives in either country a long shot. Instead what is shaping up, according to diplomats, business leaders and activists, is a hodgepodge of bilateral agreements and coalitions on everything from sustainable cities to forest protection. And on the sidelines: a climate rally that activists hope will be the biggest in history. While some analysts say the summit's goals remain worrisomely ambiguous -- one called it a "bowl of spaghetti with no spaghetti sauce on it," -- others said its real value will be in creating a defining political moment to tackle global warming. "World leaders have not really met on climate change since Copenhagen," said Jake Schmidt, international climate policy director for the Natural Resources Defense Council. Since those 2009 treaty negotiations, he said, "there hasn't been a focused conversation at the leader level to say, 'You have got to deal with this problem.'" Meanwhile, Schmidt noted, "A lot of the leaders in Copenhagen are no longer in office, so this is partly a new group. You have to have these new leaders put their stamp on this issue." A 'pledge to pledge' summit? Nations have agreed to sign a new global climate deal in Paris in December of 2015 in which all countries are obligated to contribute. But negotiators remain as divided as ever over how to carve up responsibility among rich, richer and poor for saving the planet. Countries last year pledged that all nations "ready to do so" will early next year formally submit the carbon-cutting plans for after 2020. U.N. Secretary-General Ban Ki-moon says he wants world leaders in September to prove that climate change can be tackled now. Photo courtesy of the United Nations. The summit in New York the day before the U.N. General Assembly opens was originally seen as a way to bring leaders to the table early and start hashing out a deal. That notion, though, ran afoul of some developing countries that feared the United Nations was encroaching on the formal climate negotiations. Blazing a path to Paris remains a goal, but the secretary-general has since taken pains to insist that Sept. 23 is not a negotiating session. Meanwhile, the combination of election season in different parts of the world and a still-unfinished Green Climate Fund means that only a handful of countries are likely to put forward post-2020 targets or financial pledges, observers said. "I think it's shaping up well in some ways and fuzzy in others," said Liz Gallagher, director of climate diplomacy at the U.K.-based E3G. "I don't think there's a great sense of clarity of what countries can come with." Diplomats now say what they seek is a "pledge to pledge" moment. Many developing country diplomats acknowledged last week that seeing actual money on the table is probably a long shot -- but at minimum they want to hear wealthy nations promise that money to the Green Climate Fund is waiting in the wings. "That then opens the door to developing countries coming to [the next U.N. negotiating session] in Lima [Peru] with pledges of action based on availability of money," said Saleem Huq, who advises the least developed group of countries on climate strategy. Meanwhile, sources say the United States and progressive Latin American countries intend to use the summit to push big-emitting developing countries to declare on the world stage that they will indeed contribute post-20202 emissions targets. Marshall Islands Foreign Minister Tony de Brum called those efforts useful. "We learned from Copenhagen that bringing leaders together at the eleventh hour is not a plan for success. This time, they'll be in New York a year ahead of Paris with an opportunity to confirm their intention to put ambitious post-2020 pledges on the table in early 2015, with enough time before Paris to allow us to make sure that what is being proposed can keep us on track to prevent dangerous climate change, and may give my country a hope of staying above water." 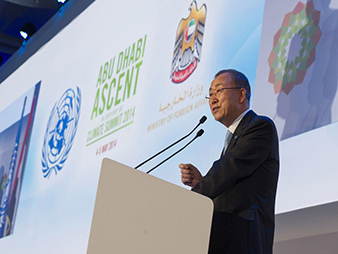 But, de Brum said, the secretary-general's summit must be about more than Paris. "Quite simply, focusing exclusively on talks to conclude a new agreement in 2015 in Paris is not a risk those of us on the front line of climate change can afford to take -- not the least because that agreement is not due to come into effect until 2020," he said. "Sure, it will help leaders provide momentum for Paris by demonstrating that others are committed to action, but it is critical that the rubber meet the road now," he said. One country that could announce something groundbreaking is China. Several sources suggested the Chinese government is poised to announce either a cap on coal consumption or a peak emissions year in 2030. Schmidt, though, offered a note of caution. "There's so many rumors on China, who knows? I think there's a very serious conversation happening in China about when its emissions will peak, and a sub-component is the adoption of a coal cap," he said. But, Schmidt added, "The question is, will they be ready and will they want to do it in September?" The best-case scenario, Huq said, would be if the United States and China came out with a strong joint political commitment aimed at rallying ambition from other countries. "I don't know if they can pull it off, but in Copenhagen they were the ones that pointed fingers at each other for the failure, and we don't want that," Huq said. "A united front between China and America would solve a lot of problems." The secretary-general's office, in the meantime, has laid out nine action areas, and observers say those are getting good traction. They are: promoting energy efficiency; touting the use of renewables; reducing short-lived climate pollutants; reducing deforestation; climate-friendly agriculture; climate action in cities; promoting low-carbon transportation; improved resilience through adaptation; and disaster risk. Despite what one observer called a "weird dance" among business, multilateral bank and government leaders to make sure all the proposals are not retreads of existing programs, many said they see promise in concrete initiatives that can lead to immediate reductions. De Brum said his country and other island nations along with the International Renewable Energy Agency are hoping to launch a global register of clean energy opportunities. The Environmental Defense Fund is trying to develop big new initiatives to reduce methane emissions from oil and gas. And retired U.K. Rear Adm. Neil Morisetti, former climate change envoy for the British foreign secretary, said he hopes to see serious discussions on addressing national security challenges stemming from climate change. Gallagher, of E3G, said there's no plan ahead that every world leader can sign up to, but a number of initiatives. "The main game is going to be in 2015, but there are things we can do now. "The summit is a chance for us to put our political masters on the spot," she added. "There's nowhere else in the world that heads of state can come together to talk about decarbonizing the power sector."